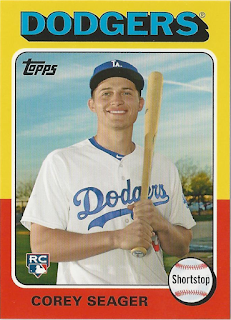 For the second year in a row Topps has released, exclusively for sale online, a mini-version of the flagship 2016 Topps Baseball card set - Series 1 & 2. Go here to check it out and order. The set includes not only eleven random base parallels numbered to only ten copies or less, but also includes a complete ten-card insert set fashioned after the always popular 1975 Topps Baseball card design. Go here for a complete checklist. Only one Dodger player is included in this set. Check it out below.